Aside from the cool factor (with Singapore’s humid weather, we’re being literal here) of being able to ‘roll’ from one point to your destination, owning a personal mobility device (PMD), whether it is a kick or electric scooter, hoverboard or unicycle, is also oh-so-convenient to get to school or office quickly from the MRT stations. It is, however, quite an investment, so do pick wisely with our guide to the best PMD. 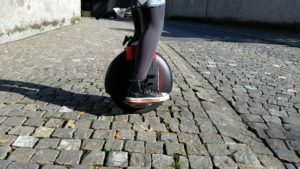 From an electric scooter, hoverboard to a unicycle, you have lots of brands and models to choose from. Features of a PMD is of utmost importance – its speed (does it get to its maximum speed quickly? ), the navigation system (whether its foolproof, easy to use? ), its protection features (if it has a hood to minimize damages if knocked upon? ), and such. Also, if you are a beginner, make sure that your device has a good stability system. Want to be traveling around with your PMD? Do note to get one that is lightweight and portable for ease of transporting it around. The newest PMD models may come with fancy all-in-one digital displays or an app that connects to your smartphones via Bluetooth. Your devices’ battery, ongoing speed and the distance traveled are just the basic details you would get on these displays and apps; some may even let you pick music to play while you ride. That, would of course hike up the price a little, but definitely a good-to-have if your budget allows. ‘Smart’ devices are after all in trend right now, and will continue to be. Just like bicycles, scooting around on any PMDs also has its rules and regulations. Get to know them before getting your ride. PMD users caught riding on the roads will be fined up to $2,000 or imprisonment of three months, or both. PMDs to have a speed limit of 15km/h on footpaths, 25km/h on shared and cycling paths. Devices must be equipped with lights that are easily visible from the front as well as the back, which must be switched on during hours of darkness. Physically, the device should be less than 20kg, have a width of no more than 700mm, and equipped with a speed no more than 25km/h. The maximum folded size of a PMD allowed on board trains and buses is 120 cm (L) x 70 cm (H) x 40 cm (W). Ready to own your very own PMD now?